Home » New River Access for West Branch! The Bureau of Forestry recently completed construction of a canoe/kayak river access site to the West Branch Susquehanna River at Baker Run in Clinton County. This site, managed as part of the Sproul State Forest, has been six years in the making. It’s open now, and ready for use! The section of the West Branch Susquehanna from the Pennsylvania Fish and Boat Commission access at Hyner, downstream to the access in Woodward Township’s Park (on the North Side of the Jay Street Bridge at Lock Haven) is about twenty-one river-miles long. This section the River is usually too shallow for most motorized boats, so it’s mostly canoes and kayaks you’ll find exploring the islands, or trying to catch a few fish. One issue however, was that twenty-one mile distance between the two access points. That’s more than most people want to paddle in one day. Many people recognized this “recreation barrier,” and when a property near the mouth of Baker Run was rumored to be for sale, the District Forester for the Sproul State Forest contacted the owners. Doug D’Amore realized if the Bureau of Forestry could acquire the property, an access point could be created, and this section of the River would be more usable for Clinton County residents and visitors. Doug negotiated with the landowners and came to agreement on a sale prices for eight acres of the parcel along Route 120 and the West Branch Susquehanna. For a variety of reasons, the Bureau of Forestry (Bureau) asked the Northcentral Pennsylvania Conservancy (NPC) to assist in the acquisition of the property for the Bureau. The Bureau often works with a local conservation group, such as NPC, when acquiring property to allows the acquisition to proceed more quickly. NPC took title to the property in 2007. They then worked with the Bureau, and conveyed it to them in 2008. The Bureau went to work designing plans for an access point. During the design process the Bureau received input from Clinton County and the Pennsylvania Fish and Boat Commission. Some of these ideas were added and incorporated into the design. Site clearing and site preparation began in 2010. Permits were applied for and processed and construction got underway in 2013. The construction took 6 months and site was ready for use in September 2013. The site is located immedietly off of Route 120, has parking for 15-20 cars, restroom facilities, and a short walking trail that goes to the River. The launch area is open and please be sure to respect all PA boating rules and regulations from the Pennyslvania Fish and Boat Commission. 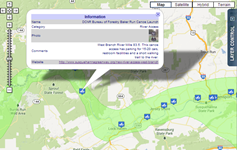 Explore the Baker Run Launch site and other features on the Susquehanna Greenway Map. Have you visited the new river access at Baker Run? Share your photos and stories with us at info@susquehannagreenway.org or on our Facebook Page!